As a Paris native, I feel the pain of foreigners painfully dragging their oversize suitcase over the zillion steps of the Paris subway stations… For sure, they read “le métro” was the cheapest, fastest way to move about the City of Light. Not wrong, if you know the do’s and dont’s like any Parisian does! 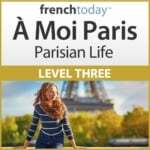 Follow my tips, then listen to my recordings to learn the Paris subway station pronunciation, and you’ll be all set to hop on the Paris subway. 1 – Move Away From the Subway Doors, Would you Please? Move away from the doors so fellow passengers can get in and out. Whether you are riding the subway for only one or two stops doesn’t matter: move away from the doors and the entrance area. Don’t worry, you’ll have enough time to make your way back to the door when needed. Start moving towards the doors when the train slows down a little and the loudspeaker is announcing the next stop. On the platform, wait on the sides of the doors. In some stations, a glass fence will protect the passengers and where the car doors will open is clearly marked. So stand on both sides, not right in the middle so passengers can get off before you get in. If there is no clear sign, then move accordingly when the subway car arrives in front of you. On some older lines of the Paris subway, you will have to open the door manually. Doors may be opened slightly after the train comes to a full stop. There will be a button to push, or on very old cars, a lever to pull up and to the right. On the more recent lines, the doors will open automatically. Don’t try to climb in the train car once you hear the closing door alarm… If you do so, the doors are going to close on you, and your purse may very well stay stuck outside… You’ll look silly. You have to be a long time Parisian to master the art of jumping in the car right at the last minute and still do it gracefully! These little foldable seats located by the doors of the subway car are called “un strapontin”. It’s common French politeness to stand when there are many other people standing in the entrance of the train. You’ll take less room standing than sitting. Whether you are sitting on “un strapontin” or in the designated sitting area, earn some “good tourists” points by offering your seat to an elderly person, someone traveling with an infant, or a pregnant woman. Say “vous voulez vous asseoir ?” (would you like to seat) with a smile, and you’ll notice a vibe of appreciation coming from all your fellow passengers. You may even get a nod or a smile out of them. Always keep your valid ticket with you until after you exit the Paris subway network (don’t throw it in the trash as you’ve just exit your subway car). There are frequent controls in the corridors, or by the exit (not just within the métro car) and if you don’t have a valid “ticket de métro”, you will be fined! Think twice before riding the Paris métro with a large suitcase or a bulky strollers. The Paris subway is mostly underground. Sometimes, such as for the métro line number 2, part of it is on bridges, overhead. In any case, getting to the Paris subway platform will involve stairs. A lot of stairs! You’ve been warned. A few stations do have elevators, but most don’t. Honestly, don’t take the subway with a large suitcase, especially when it’s not a direct route… No self respecting Parisian would! Check the bus routes, or splurge for a Parisian taxi or an Uber! So, you have your métro map in your hand, or are consulting a great métro app. You know the Paris subway station closest to your destination, and are now figuring out the fastest route to get there. It may involve several connections (une correspondance). Just be aware that some connection are very long (and therefore involve A LOT of stairs)… I’ve counted many fifteen minute (of fast walking) connections in the Paris subway… Thank goodness I was not hauling a suitcase! Surprise! The black strip on the ticket is magnetised: being in contact with coins may de-magnetise the ticket, and the machine at the métro entrance will refuse it. So you shouldn’t keep your subway ticket in your wallet… How practical! You don’t really need to say anything, since this happens a lot, the clerc should understand and simply hand you another ticket… Just in case, say something like: “excusez-moi, mais mon ticket ne marche pas” (sorry, but my ticket doesn’t work). The Paris métro stations are announced by a loud speaker, and there are also maps on the walls where you can check your itinerary. Some are electric and you will see the next stations lit-up. It’s always a good idea to check with the map that you are actually going in the right direction! If you are not, no panic! Just get off at the next stop, and follow the sign showing the first station name of the direction you need to go to. No need to buy a new métro ticket, you can change direction, and make multiple connections with the same ticket. Your ticket is valid until you go through the subway exit doors. Mind your belongings when riding the Paris subway. Unfortunately, there are many pickpockets, and they are extremely good at getting to your wallet, even if it’s in your front pocket or in your purse…. So wear your backpack on the front, on your torso, carry a purse which zips and keep you arm over it at all times. Better yet, wear a money belt (it’s not super trendy but it’s safe). Getting through the subway doors if you have many luggages is going to be a challenge. Be aware that you are particularly vulnerable at that point. There is usually a buzzer which opens a gate on the side to enter the subway when you have cumbersome luggages or a stroller. There are many scams in the Paris subway: in particular, people dressed like subway employees who claim they will help you get your ticket. They’ll take your cash and give you a free child ticket, or anything but what you’ve paid for. There are also real employees who are actually there to help tourists out… So not everything is a scam either! Something is clear: unless the person is at a booth behind a glass door, you should not hand them any cash. A legit employee will show you how to work the ticket machines: they may press the buttons for you, but you will be the one inserting cash or card into the machine. There are also a lots of beggars in the Paris métro. Some will be in the corridors, some will board the cars, briefly shout out their sad life story and predicament, and then go through the car and ask for money. Some people asking for money are artists, musicians: they’ll play something and then ask for money: enjoy, they are often excellent! Whether you give money is up to you. I always give something to a good musician, but you certainly don’t have to. Watch out though: giving some change out of your pocket is not a problem. Getting your wallet out and showing bank bills could put you at risk. So… if you plan on being generous, keep some change in your pocket before you get in the subway! Be aware of your surroundings. If you look aware, you are less likely to become the target of pickpockets. Unfortunately, this is also a question of pure (bad) luck! Yes, you’ve heard many stories and I’ve just warned you… There are indeed many pickpockets, beggars etc… riding the Paris métro. But there is a large majority of normal, decent people. So, if you are in trouble, say so! Be aware that the first person you ask may be too busy to even stop… It’s a bit rude, but, you are in a big city, and people are often in a rush… Don’t take it personally and try someone else. The Paris subway is a tough environment. However, you will witness acts of candor for your fellow passengers: helping someone with a stroller down the stairs, giving up their seat for an older person… You do need to be aware of what could possibly go wrong, and you will see sad things such as homeless people catching a bit of a sleep in a station during the cold winter… You will smell pee and may catch glimpse of a rat or two (look on the rails…). But you should also admire the beauty of some exceptional métro stations, enjoy the talent of incredible musicians, and see the kind gestures happening discreetly, but surely, all around you. 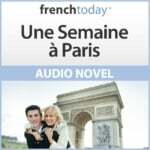 Follow the links to access my blog articles with clear recordings of the Paris métro station name pronunciation, subway maps and more. You too have a Paris métro tip or story to share? I’d love to hear it: please share it in the Disqus section below!